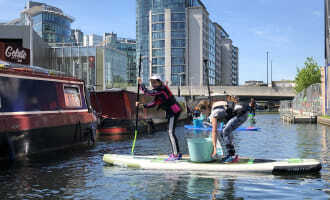 This is a monthly club for women, called SUP&POD. The aim of the group is to get together to create meaningful conversations, meet new people and have fun paddle boarding on the canal. We create our meaningful conversations by asking everyone to listen to the same podcast before we meet up and then we get together to have a chat about it. Think book club, but with a podcast instead. We are a really fun group, who just want to have a great informal chat and go for a paddle. No specialist clothing is required. In warm weather, ordinary gym gear will be fine (shorts/leggings/T-shirt/sweatshirt), with old sandals or trainers you don't mind getting wet. Or you can get cheap neoprene wet shoes from most large supermarkets. No bare feet, footwear is required at all our SUP locations. In colder weather (November - March), a wetsuit would be advisory. We have wetsuits available if requested in advance. Always bring a towel and a change of clothes just in case you take a little dip during the SUP lesson. The group is suitable for beginner paddlers and women of all abilities and ages. You will need to be able to swim and be confident in the water. Certain level of flexibility and ability to get up to standing from kneeling is required for learning to paddleboard. 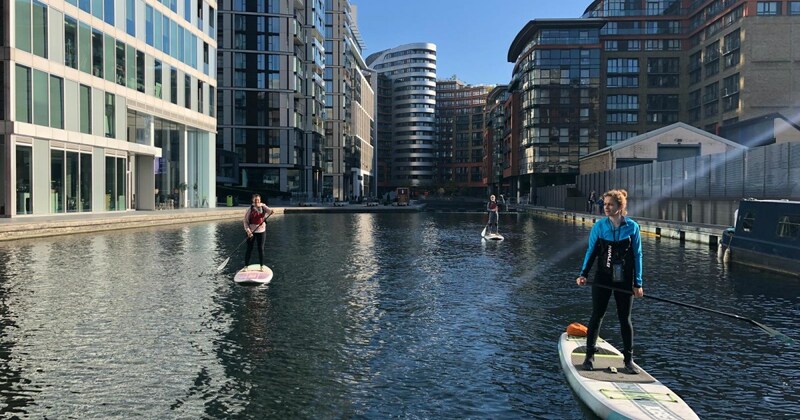 The session will start with some land-based training at our base in Paddington Basin, before getting onto water and piercing through the heart of London on the Grand Union Canal. We will pass through iconic London landmarks such as Little Venice, Saint Mary Magdalene Church and Trellick Tower*. After stopping for a short break, we will return to base. You will have the opportunity to keep paddling during this break if preferred. *How far we get depends upon the conditions on the day. Canalway cavalcade event 1.5hrs paddling and cleaning Paddinton to little venice waterways.